The six apartments in the ground garden of the house " Serene 'Of Jean-Pierre and Brigitte Gay welcome at this time of vacationers from all over France and abroad. Expatriate friends of Qatar and Congo have chosen, to meet, Saint-Georges , be equidistant from the source regions of the three families but also for its position between the sea and hinterland and the gates of Montpellier. There are also Italian tourists Florentines, Swedes… and Mayennais. They like to take the pot of friendship in the garden of the house with the couple and Gay their Dutch friends, Antony, Magda and Soise Fintelman, they dated for a decade at the lodge. Now, Fintelman family is permanently installed in St. George where she participated in local life. 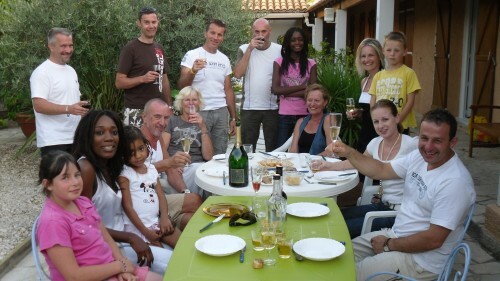 The cottage Serene Jean-Pierre and Brigitte Gay which consists of five apartments on the ground floor welcomes the holiday season from all over France and abroad. Around a tasting wines of the three colors of the basement of St. George and commentary offered by Father Gay, founder of the house, we met, three families of tourists. Les Baumer, corporate directors in Besançon, came in the South practice paramotor, sort of paraglider wing with engine. They chose St. George for its proximity to the ground ULM Pignan. In addition to the overview of the region, they love the wilderness of the backcountry and do not like the "wildlife" that frequent the beach. The couple Fleurot, taxi-ambulance retirement, Nancy came down with their teenage daughter Karine prospect for the region including accommodation for Karine has just been appointed to the CNRS. He knew this house by friends St. Georgians, the Rigal. Mr. knows the area very well because it is native to Lattes he left there 44 years to follow in Ms. Lorraine who came on holiday in the corner. Chick Ortega, professional actor, residing in the Val d'Oise , spent a month at the lodge. He wanted to be near Montpellier, city ​​he loves. St. George was chosen by chance on the internet. With her two children, Angelo et Théo, old respectively 8 and 9 years, and his wife Tatiana, when not playing at the theater, it crosses the region, Sea to the Cevennes and the Camargue to the Vermilion coast. Chick Ortega played in many films (A great time, An Indian in the city, Royal Palace…) and theater. During his stay at the lodge, he made a getaway in Ramatuelle for in a play at the festival poster. 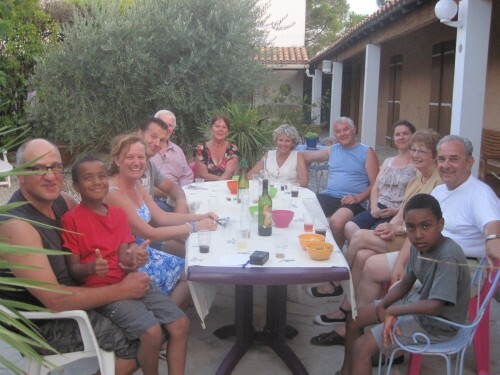 All hosts enjoy the tranquility of the place, the home owners, local wines, the village close to Montpellier, between sea and scrubland, away from major thoroughfares and major shopping areas.